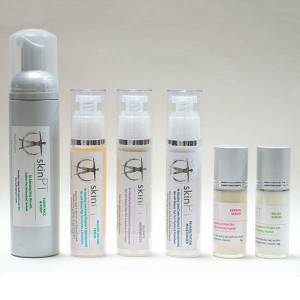 Rebuild the loose and crepey skin on your face, neck & “deck” with Rehabilitation Face Serum and your 4-Step skinPT Home Program. Think about the structure of a house. If your house was damaged structurally, you would not just paint the outside to fix it. You would need to rebuild it’s foundation, walls and roof. It’s the same for skin. If the structural integrity of your skin is compromised, no amount of cosmetics will repair it. That said, we do have active ingredients available today that are proven through research to significantly repair damaged skin. Rehabilitation Serum is stacked with these powerhouse ingredients. 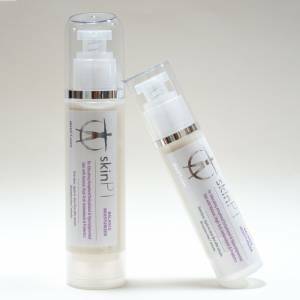 Combine daily use of Rehabilitation Serum with your 4-Step skinPT Home Program and enjoy healthy skin that is bone deep! Got loose and crepey skin? 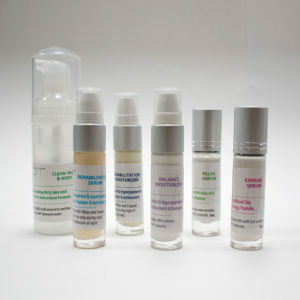 Put your skin into a 4-Step Physical Therapy Home Program including Rehabilitation Face Serum. Remodel your loose and crepey skin with your daily commitment to this routine. All ingredients in Rehabilitation Face Serum are safe, research-backed, and non-GMO. The formula is also free of parabens, fragrances, dyes and harsh chemicals. 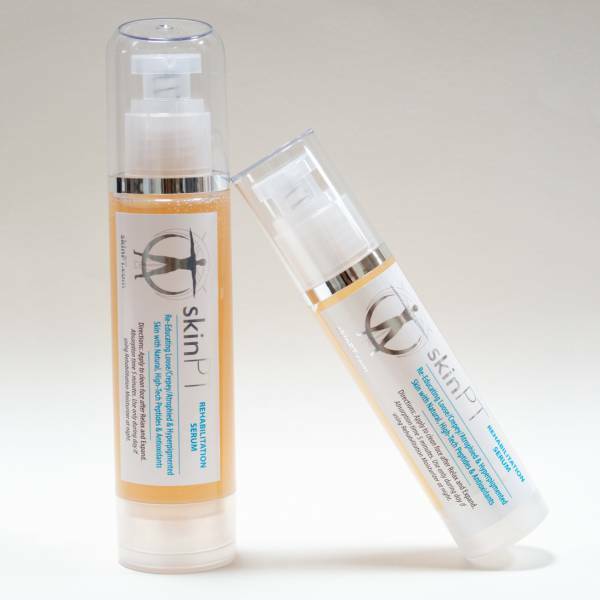 Resistance provides your skin the necessary firmness to withstand external forces. Flexibility allows your skin to be temporarily deformed & accommodates your body movements. Elasticity provides your skin with return to starting position following deformation (also known as “spring-back”). Finally, there is deformation, which is the point where skin permanently deforms if enough stress is applied either too quickly or applied over too much time. If our body’s ability to regenerate declines, this results in inferior architecture and impaired biomechanics. Nobody wants loose and crepey skin. We have more choices available to us than a “quick fix” that wounds and burns our face, neck & “deck”, leaving us worse off than we were before. LEARN MORE HERE. It’s not our fault when we make such choices, we are just not informed. It’s not the experts’ fault, they don’t think like a physical therapist. PT’s seek to improve movement and function, expand movement potential, and improve quality of life. It’s all about the art or feng shui of our body’s architecture, if you will. You can stimulate the natural regenerative processes to re-educate, reconstruct and reinforce your architecture. The result is a human design that is real and lasting, inherently beautiful and uniquely yours. Propanediol, Hexapeptide-10, Xanthan Gum, Glucose, Carrageenan (Chondris Crispus), Tripeptide-10 Citrulline, Tripeptide-1, Acetyl Tetrapeptide-2, Acetylarginyltryptophyl Diphenyglycine, Dimethyl Isosorbide, Adipic Acid/Neopentyl Glycol Crosspolymer, Glycerin, Pseudoaltermonas Ferment Extract, Hydrolized Wheat Protein, Hydrolized Soy Protein, Lecithin, Amber Extract, Poria Cocos Polysaccharide, Plankton Extract, Adipic Acid/Neopentyl Glycol Crosspolymer, Acetyl Hexapeptide-37, Enteromorpha Compressa Extract, Caesalpinia Spinosa Gum, Gluconolactone, Acetyl Hexapeptide-2, Pseudoaltermonas Exopolysacchrides, Saccahride Isomerate, Trimethylpentanediol/Adipic Acid Copolymer, Sclerotium Gum, Pullulan, Palmitoyl Dipeptide-5 Diaminobutyloyl Hydroxythreonine, Palmitoyl Dipeptide-6 Diaminohydroxybutyrate, Gluconolactone, Sodium Benzoate, Citric Acid. Im 53 yrs young! and rehab serum is helping me stay that way! Makes my skin feel firmer and super hydrated. I use it on face,neck, and arms. Love it! I have a problem with hyper pigmentation and I tried everything for it: Laser (at least 8 laser treatments), Chemical Peel (medical grade), multiple expensive serums and products for the past 3 years with little to no change. It was closing battle and I basically gave up on trying to fix that, surrendered to my fate and started using this for general anti-aging and it worked well for keeping my skin with a youthful appearance. After about 3 months of regular use 2x/day, I noticed my pigmentation is radically decreased! I mean RADICAL. I almost forgot about it because it happens gradually and the one day I realized my pigment “beard” was gone! So happy. I am hooked! It does have an odd smell but that goes away after about 15 minutes. Well worth it. It spreads well and lasts a long time. I love the Rehabilitation Lotion. I use it with other serums in the line as a final step. It keeps my skin nourished, hydrated, and reduces the signs of aging…especially when combined with Jade’s Laser Genesis treatments. I even got my husband to use this daily! I love this Rehabilitation Serum, I can feel how nourishing it is to my skin as a put in on my face in the morning. It has a lovely smooth texture, not sticky even in Maui and my skin eats it up! My friend tried for years to get me to see Jade for my crepe skin and i couldn’t understand what she meant until I went there, received treatments and started using this serum! This serum has changed my skin for the better and friends are noticing. I guess I don’t have to “get old” after all. I have never experienced anything like this. My skin looks amazing! The mouth lines are decreasing by the day and my skin is bright and very youthful looking! A little goes a long way.